Are there advantages to using alternative lenses on micro 4/3 cameras? Well yes there are. Though between them Olympus and Panasonic have put together a decent set of lenses, not everything is catered for. One good reason for using them is that at the moment, the 20mm f/1.7 is the fastest lens available. This is about to change shortly with the Olympus 12mm f/2 and 45mm f/1.8 and the Panasonic 25mm f/1.4, but up to now there has been a distinct lack of fast primes. As ever there is a larger version available on flickr by clicking the image. So what was the difference? The answer, quite simply, is not much. I'm leaving out the fact that the Voigtlander is a faster lens and have only compared the two within the zooms range. There is a bit of purple fringing from the zoom (around the mosaic pattern on the chair) but I'm hard pressed to see any difference in sharpness. The zoom is a little warmer, and the Voigtlander is probably the most accurate. Looking really hard at the images at 100% on my monitor, I think that the Voigtlander is probably very slightly sharper, but it is a very small difference. 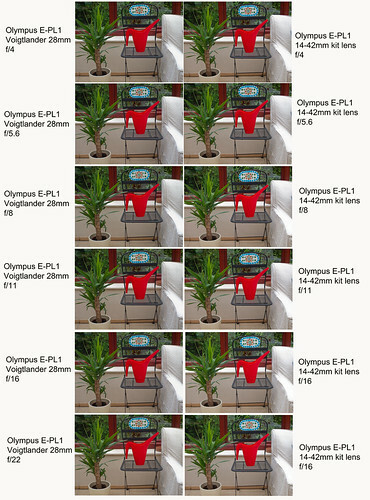 Personally I've always rated the Olympus 14-42mm quite highly for a kit lens, and this test shows that to be the case. Its always been my contention that the sensor is the most important element in this anyway. Plus making sure all elements that can affect sharpness are eliminated, such as focusing errors and camera shake. I'd be perfectly happy with the results from the zoom for my stock photography. I think this does show that the idea that there are very few "bad" lenses anymore has some basis in fact. True not all standard kit zooms are good. The Canon 18-55mm is a disgrace and I wasn't that impressed with either the 20-50mm Samsung zoom for the NX series or the Pentax 18-55mm. 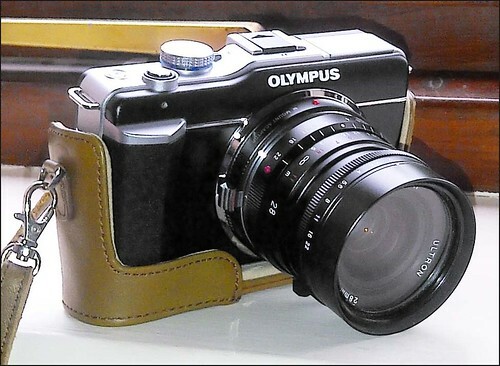 However the Olympus is a good decent lens. Plastic mount - yes, and I do hate that compact camera extension but in terms of producing images, it does the job very well. As to whether its worthwhile buying m-mount lenses for use on m4/3, thats for people to decide themselves. Personally, I've always thought that exploring the range of Nikon and Canon lenses is a cheaper alternative, and if you pick the right ones you won't be compromising on quality. The shortly available Olympus and Panasonic lenses will offer good AF options, but if you're prepared to put up with the hassle of manual focus, and it is a hassle, then there are lots of cheaper options. True, you're not going to find an option to the Olympus 12mm f/2 other than some dreadful c-mount video surveillance lens, but from 24mm > there are some excellent alternatives available. So are there advantages to using alternative lenses? Well, as far as I'm concerned, yes there are, but maybe not as many as you think. I certainly wouldn't recommend people buying the more expensive m-mount lenses in order to get better image quality, but theres no denying the quality feel that they give. Many of these old design film lenses are things of beauty and a world apart from a polycarbonate kit zoom. If you have the budget, it does make for a very satisfying photographic experience. But will it mean your images leap off the screen at you? Probably not.